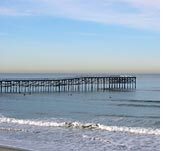 Between the tide and the Ocean Front Boardwalk, Pacific Beach is a stretch of golden sand. Along the coastline, you’ll find resorts and hotels, green parks, bike and board rental shops and beachfront dining with an amazing view. Beach beauties sun themselves on the golden sand while the excited sounds of a game of horseshoes drifts on the breeze. In the splashing waves, dolphins and surfers abound. Beautiful sunsets cast hues of color over the water as lovers take a romantic stroll along the beach. 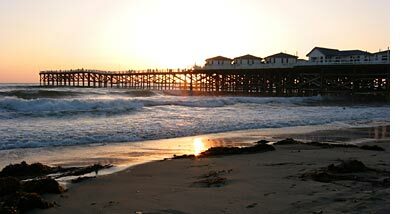 The stunning sunsets of Pacific Beach makes it a popular haunt for both amateur and professional photographers. Diners will delight in the diversity of the Pacific Beach restaurant community. Here you will find the most unique cuisine in the San Diego area. Enjoy simple beach fare, gourmet pasta, seafood of all kinds cooked to perfection, as well as Chinese and Thai. As the sun sets and the tides change, nightspots come to life. Relax and enjoy live music, dancing and beach bars that are all just a short walk from the beach and area hotels. breathtaking views of the ocean. Board the Bahia Belle, a historic steam paddle wheeler that sails the inlets surrounding Mission Bay alongside sailboats and canoes. Bahia Belle brings back memories of bygone days as it sets out from Catamaran Resort. It’s a beautiful way to experience the stunning scenery in the area. Be sure to bring your camera along to capture the beauty of the area. Mission Bay is popular for water activities such as swimming, water skiing and jet skiing. Breathtaking sunsets are the norm. As the sun sinks below the horizon, build a fire in one of the fire pits on the beach and participate in a storytelling session with friends. Search for treasures in the golden sand and shop at hundreds of boutiques in Pacific Beach’s shopping district. Garnet Ave. is a shopper’s paradise. Local favorites include Pangae Outpost, Great News and a variety of others. Brand name shops include Starbucks, LA Rock and American Apparel. From resale clothing stores to designer boutiques and retail stores, the shopping district offers something for everyone. Beach friendly services, restaurants and a wide variety of other amenities can be found in the shopping district. 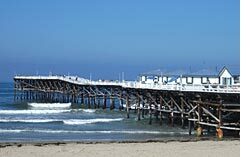 Crystal Pier brings the past of southern California to life. The historic pier was constructed in 1927. For a unique overnight experience, reserve a room at Sleep over Seas, which is located at one end of the pier. At the other end, there’s a place to cast your line and take in a great day of fishing. Choose a vantage point for a bird’s eye view of male and female surfers as they catch the swells. It’s amazing to watch these surfers catch a wave while the old wooden pier rocks with the tide. Pacific Beach is a beach lover’s paradise. Whether you visit during the day or at night, there are a wide variety of opportunities for fun and enjoyment.